HCH ultra-fine grinding mill is especially suitable for ultra fine grinding. With years’ accumulation of experience in R&D, the HCH Ultra-fine Grinding Mill is a new ultra fine pulverizing equipment designed by Hongcheng. This mill is widely used to grind any non-metal minerals with Moh's hardness below 7 and moisture below 6%, such as talc, calcite, calciumcarbonate, dolomite, bentonite, kaolin, graphite, carbon black, etc. HCH Ultra-fine Grinding Mill features in space-saving, completeness, wide usage, easy operation, smooth performance, high performance-cost ratio and high efficiency. HCH1395 Grinding Mill is the biggest ultra fine circle-roll grinding mill in China. With years’ accumulation of experience in R&D, the HCH ultra-fine grinding mill is new ultra fine pulverizing equipment designed by HongCheng. This mill is widely used to grind any non-metallic minerals with Moh’s hardness below 7 and moisture below 6%, such as talc, calcite, calcium carbonate, dolomite, bentonite, kaolin, graphite, carbon black etc.. Product fineness can be adjusted within a range from 325 mesh to 2500mesh and its disposable fineness can reach D97 ≤ 5um. HCH ultra-fine grinding mill is especially suitable for ultra fine grinding. After a long period of market application practice and user authentication, the device HC1395 model was certified by the China Association of calcium carbonate for energy-saving equipment in China's calcium carbonate ultra-fine processing industry. HCH1395 is the biggest ultra fine circle-roll grinding mill in China. This HCH ultra-fine grinding mill features in space-saving, completeness, wide use, easy operation, smooth performance, high performance-cost ratio and high efficiency. Technological process: The pre-grinding raw ore material will be crushed into particles＜10mm and transport to the feeding hopper by the elevator, then feed into the grinding chamber by the feeder. The grinding rollers equip on the rotary table rotates around the centre shaft. There is flexible gap between the roller and ring. 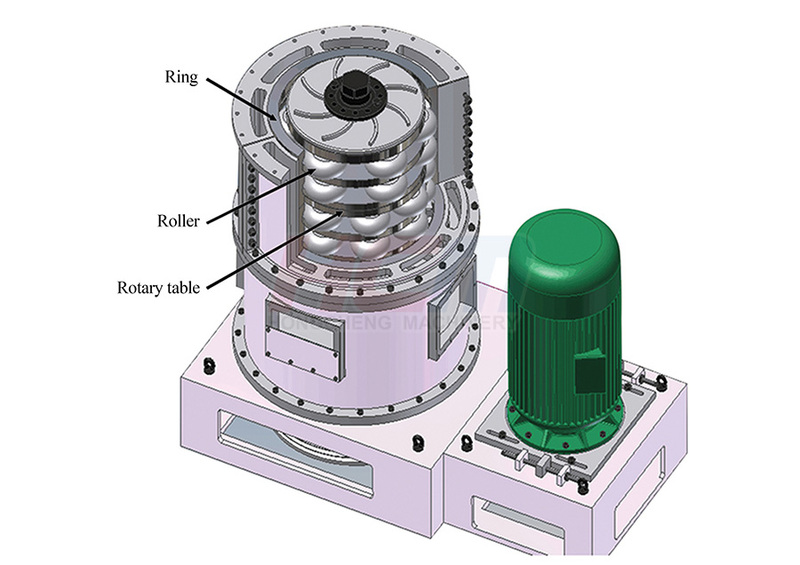 The rollers rotate outward by the centrifugal function to compress the fixed ring. The rollers also self- rotates around the roller pin. When material passed through the gap between the ring and roller, the material will be smashed by the rotating rollers. Four layers of rollers. Material will be grinded 1st time when passing the 1st layer of roller and ring. Then be grinded second, third and fourth time when loop through each layer rollers. Thus the materials were grinded sufficient and obtain much fine powder. The powder fallen down onto the bottom table by gravity will goes up to the classifier for separation by the airflow from blower. The qualified fineness passing from the classifier will be collected by the pulse bag collector as final product, while unqualified fallen down for regrinding till passing through. The powder goes with air flow into the pulse bag filter and collects by the discharging valve. The wind path is in circulation and the airflow is in negative pressure. There will be no dust escape, so the equipment can ensure a no dust operation in workshop. 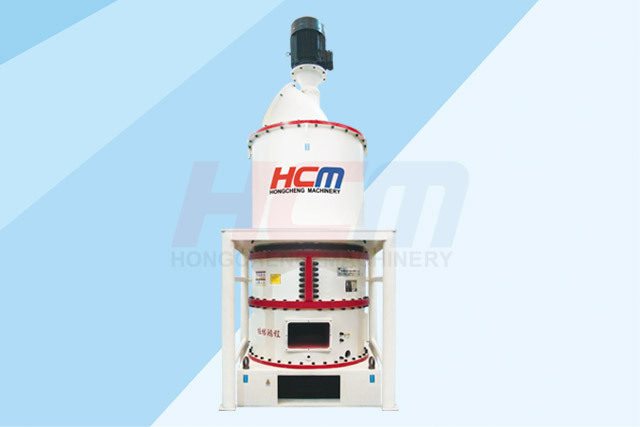 HCH Ultra-fine Grinding Mill is widely used to grind any non-metallic minerals with Moh’s hardness below 7 and moisture below 6%, such as talc, calcite, calcium carbonate, dolomite, bentonite, kaolin, graphite, carbon black etc.. This kind of mill is especially suitable for ultra fine grinding. The fineness can be adjusted from 0.045mm(325 mesh) to 0.005mm(2500 mesh), whose range is much wider than that of traditional Raymond Mill. 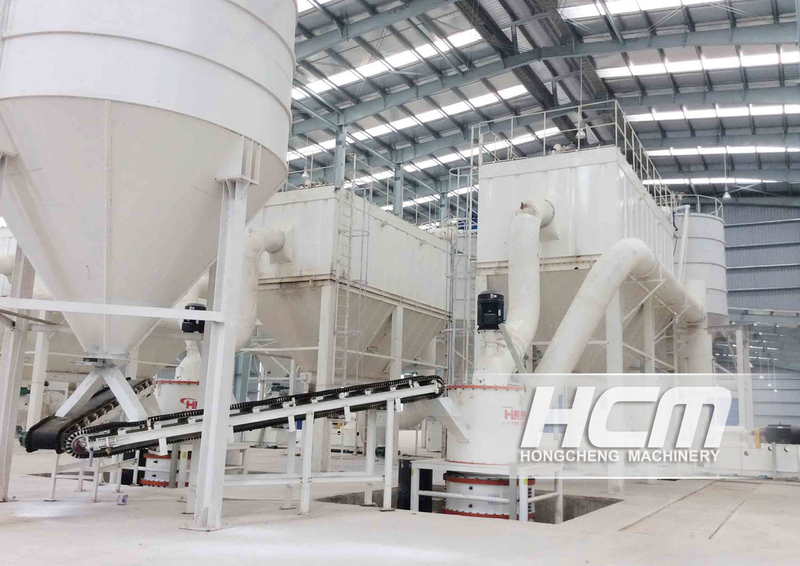 HCH Ultra-fine Grinding Mill consists of main mill, classifier, blower, belt feeder, storage hopper, pipe system, pulse dust collector, gearing system and electric control cabinet. Note:The capacity is for calcite powder(Feeding Size≤10), and specification is just a reference. The actual production depends on these materials being processed. Higher production capacity and lower power consumption: Non metallic mineral particles feed which feeding size is less than 10mm, can be one-time processed as < 10 m powder (97% passing). The particle size less than 3um accounted for about 40%,which contributes to a larger specific surface area. It has the advantages of low cost, high efficiency, and good product fineness. Wide fineness and flexible adjustment: Turbine classifier (patent no. : ZL201030143470.6). The fineness can be adjusted flexibly from 0.04mm (400 mesh) to 0.005mm (2500 mesh). Products with various fineness can meet the market needs and improve your competitiveness. Environmental protection: The pulse collecting system will remove 99.9% of the dust, ensuring dust-free operation environment. 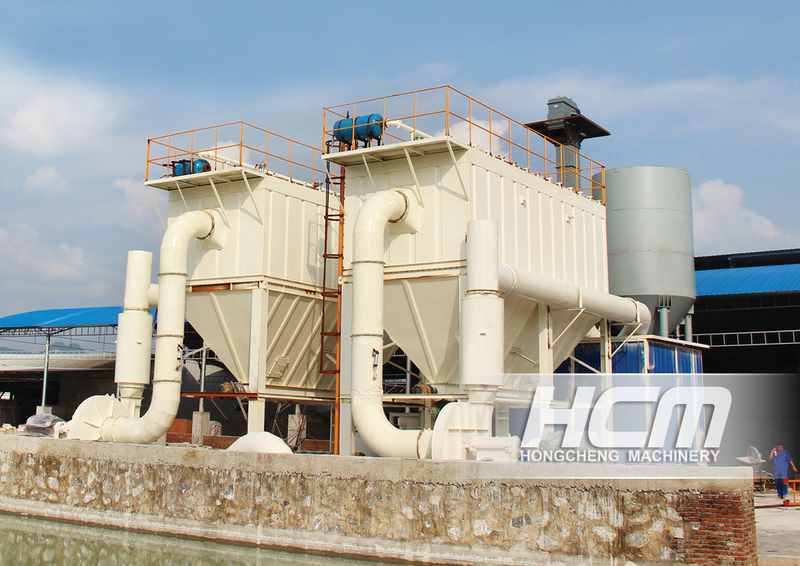 The pulse dust collection system is Hongcheng special invent comply for the environment protection requirements. Thorough Cleaning：The pulse dust collection system is adopted with pulse-jet type of cleaning. By utilize the compression air to shoot clean each filtering bag. High and complete dust cleaning. Prevent bags from powder stocking. The wearing parts(roller and ring) made from special wear-resistant material which prolongs working life. The mill base is inblock casting, which ensures the structural strength and alleviates vibration.